The SpaceX Dragon commercial cargo craft is grappled by the International Space Station's Canadarm2 robotic arm on Oct. 10, 2012 during the spacecraft's first cargo delivery mission for NASA under a $1.6 billion deal for commercial cargo delivery. The private Dragon spacecraft is set to return to Earth Sunday (Oct. 28), wrapping up the first-ever commercial cargo mission to the International Space Station. 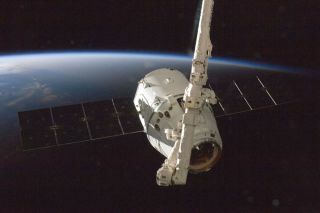 The unmanned Dragon capsule, built by the California-based firm SpaceX, is scheduled to undock from the orbiting lab at 7:55 a.m. EDT (1155 GMT) Sunday, then be released by the station's huge robotic arm about 90 minutes later. If all goes according to plan, Dragon will splash down in the Pacific Ocean off the California coast at 3:20 p.m EDT (1920 GMT) Sunday, where SpaceX personnel will retrieve it with a crane-equipped boat. You can watch the Dragon's undocking live on NASA TV here beginning at 7 a.m. EDT (1100 GMT). Dragon launched atop SpaceX's Falcon 9 rocket on Oct. 7, kicking off the first of 12 robotic supply flights the company will make for NASA under a $1.6 billion contract. The capsule arrived at the station three days later, delivering 882 pounds (400 kilograms) of supplies and scientific experiments. Dragon will bring 1,673 pounds (759 kg) of cargo back down to Earth Sunday, including 866 pounds (393 kg) of scientific research gear, NASA officials said. NASA is looking to American companies such as California-based SpaceX to fill the crew- and cargo-carrying void left by the retirement of the space shuttle fleet in 2011. The agency also signed a $1.9 billion deal with another firm, Virginia-based Orbital Sciences Corp., to make eight unmanned supply flights with its Antares rocket and Cygnus spacecraft. Orbital plans to test-fly Antares for the first time later this year. Meanwhile, Dragon's second official supply mission is slated to blast off in January. That flight will actually mark Dragon's third visit to the space station; it first docked with the orbiting lab in May of this year during a historic demonstration mission. SpaceX is also working to develop a manned version of Dragon, in the hopes of winning a NASA contract to ferry astronauts to and from the space station. The company has said it may be ready to carry crews by 2015 or so. Three other firms — Sierra Nevada, Boeing and Blue Origin — have also received NASA funding in the last two years to develop crewed vehicles. NASA hopes at least two of the four companies have manned spaceships up and running by 2017.